It has become commonplace for politicians talk about the need to secure the US-Mexico border. Yet the perception of an unsafe border is not backed up by official crime rates and statistics, or the everyday experiences of people in American cities along the US-Mexico border. How do border residents feel about security and crime? The overwhelming majority of residents of El Paso, Texas, reported feeling safe in their city, according to a recent survey I conducted. And contrary to common political framings about immigrants and crime, the foreign-born population has a lower felony conviction rate than the US-born. El Paso is a relevant place to examine safety and security along the US-Mexico border. 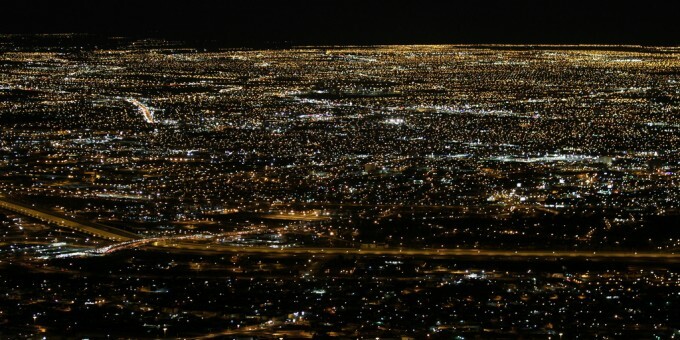 After San Diego, El Paso’s metropolitan area is the largest urban area located along the border. El Paso sits right next to Ciudad Juarez, the largest Mexican border city. In 2011 and 2012, during the height of the violence in Ciudad Juarez, I surveyed 919 residents about their perceptions of crime in El Paso; the overwhelming majority reported feeling safe. The media often presents an image of violence and chaos at both sides of the border, but the violence has been limited to certain parts of the Mexican territory. Unfortunately, it is true that Mexico has experienced high levels of violence in the recent years. At some point, homicide rates were higher in the Mexican state of Chihuahua than in Afghanistan. Ciudad Juárez was called one the most dangerous cities in the world with 282.7 homicides per 100,000 inhabitants. But located directly across Ciudad Juarez, El Paso had the lowest crime rate of any city with more than half a million inhabitants. Correa-Cabrera finds that violent crime rates in the US border cities of Laredo, Brownsville, and McAllen decreased from 2006 to 2010, during the peak of drug war violence in northern Mexico. Thus there are very different crime rates between the cities across this international border. While these differences are crucial for local residents, they get blurry to observers far away from the border area. I directed a survey of 919 housed Hispanic residents El Paso in 2011 and 2012 about a number of demographic, social and health behaviors, including questions about perceptions of security. The survey was conducted in person in English and Spanish. This was not a household based survey, with the aim to enlist respondents who were undocumented or had non-traditional living arrangements. Homeless respondents were removed from these analyses because given their unstable housing situation they have a higher perception of insecurity. The sampling was purposive and not a probability sample, yet the sample size and triangulation with other data makes it illustrative. A limitation of this survey is that it only includes the views of Hispanics, but this is not a major obstacle because Hispanics make up 81.3 percent of the residents in El Paso (see appendix table for sample information). Table 1. How safe do you feel in your neighborhood? How do you describe your neighborhood? Respondents were selected purposely from neighborhoods across El Paso with different degrees of poverty. Before the question on safety, respondents were asked how they would describe their neighborhood. The answer was open-ended to avoid priming or biasing the answers, thus the survey did not list any descriptions for the respondents to choose from. The respondents provided a variety of different answers, yet they could be easily categorized in a few set of answers. I kept “calm” different from “good” or “safe” to keep some of the nuances reported by respondents. Table 2 illustrates that the majority of respondents, (43.2%) described their neighborhood as “calm” followed closely by “good” and “safe.” The great majority used terms that characterize their neighborhood with a positive connotation. Only 3.2 percent of individuals described their neighborhood as having a “bad reputation.” These descriptions provide more evidence that El Paso residents feel safe in their neighborhoods. Table 2 How do you describe your neighborhood? In response to the question, “Have you encountered any problems with the law [criminal, civil, immigration court]?”, 17.3% of those born in the US answered positively while a lower percentage (9.5 %) of those born abroad had no problems with the law. When asked whether they had ever been convicted of a felony, 2.5% of respondents reported having a felony conviction. When comparing foreign-born populations with criminal conduct, the foreign-born population had a statistically significant lower felony conviction (at 1.1 %) than those who were U.S. born (3.5%). Encounters with the police also varied, 12.9 % of the US-born Hispanics and 6.2% of foreign-born Hispanics reported having been detained unjustly by the police. Published research from this same study has also established that recent immigrants are less likely to use illicit drugs. Furthermore, residents from El Paso that do cross the border to visit Mexico are less likely to use illicit drugs than does who do not cross. These results add to existing evidence that crime is low in border cities. A study conducted in the border city of San Diego, California, showed that neighborhoods with a growing number of immigrants saw a reduction in violent crime. A survey of 1,222 residents from ten major border cities from California to Texas conducted by the Border Network for Human Rights finds that 67.1 percent of respondents feel safe living in a border community, 69.7 percent feel their border neighborhood is as safe as most U.S. neighborhoods, 51.8 percent feel safe allowing their child to play in a neighborhood park, and 87.5 percent said they feel safe walking or driving in their neighborhood. A 2016 survey for Cronkite News, Univision, and the Dallas Morning News across cities in both side of the border found that 92% of respondents in the US border felt safe in their neighborhood at night, compared with 54% on the Mexican side. Furthermore, only 14% of border residents in the US said that US should definitively build a border wall. Border residents feel safe; the border fence and large increases in the number of border patrol agents have not deterred immigration itself but it has increased deaths in the dessert and extended the time that undocumented workers stay in the US joining their families back in Mexico. Determining how safe the southwest border is can be established through the perceptions of border residents. Residents of El Paso, Texas feel safe living next to the border with Mexico. 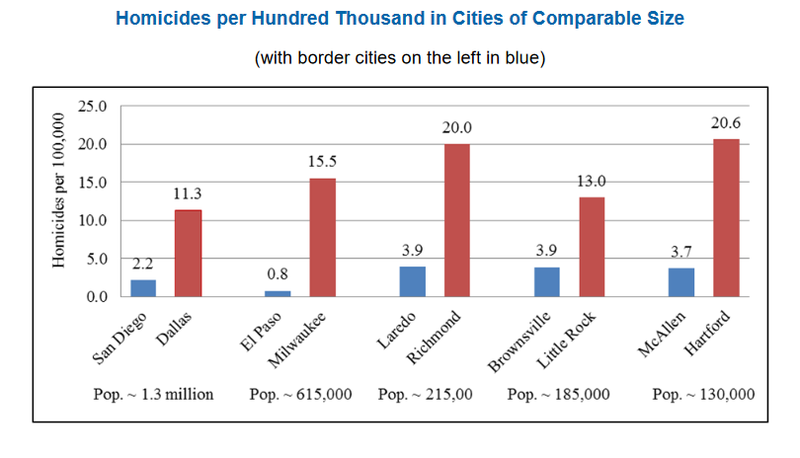 Furthermore, border cities are in fact safer than cities far from the border of equivalent size. Source: 2010 data from the FBI. 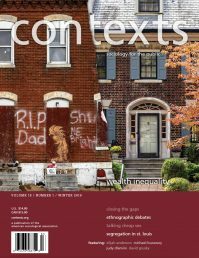 These results about safe border communities also build on social science research which has found that cities with high immigrant populations display a lower crime rate, and also support the research that finds that neighborhoods with high levels of immigrant populations saw a reduction in violent crime. Researchers have also found that nationwide immigrants are less likely to be criminals than the native-born. The perspectives of border residents provide an authentic interpretation of border security. El Paso residents do not display any sense of danger living within close proximity to Mexico. As academic research, analyses of crime data, and surveys show border residents feel safe. That was my own experience while living in El Paso between 2010 and 2015. The high concentration of federal law enforcement agencies may help deter open criminal activity but so do the increasing job opportunities in the US and hopes of social mobility for the children of immigrants. Migrants come to the US to work and improve their economic situation; the great majority does not want to commit crime and jeopardize the future of their families. The border wall means different things for different people, including for those living in the border region. While many project their fear of the unknown onto the border region, for millions of Americans the borderland is home. Ernesto Castañeda is in the sociology department at American University. Interesting how this study focused on San Diego and El Paso, two communities with updated border fencing/barriers and reported significant drops in crime since erection. I would be interested to hear what the more rural communities without updated barriers and rural residents have to say.